Offering a more traditional look our French doors come with the same high specification and colour choices as our window range. Demand for coloured themes for all products has soared over recent years as colour bonding technology has improved. Now all products are available in any colour of your choice. 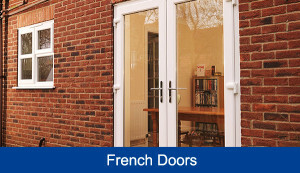 Available in either an ‘open in’ or ‘open out’ style to suit your living space, our French door provides your home with a beautiful and secure entrance – along with a range of low and ultra-low threshold options. Ensuring you enjoy the maximum amount of natural light in your home, the fully sculptured features of our French door provides a beautiful finish. All the security of our doors are fully accredited to meet the necessary standards, including Secured by Design and PAS 24:2012, plus they are fully compliant with the latest relevant divisions of the Building Regulations (including Part M) compliant and a great range of hardware, finishes and glazing options.